With a history steeped in innovation and a focus on the technology of the future, Lyndex-Nikken is the leader in manufacturing innovation. Our industry-leading design and capabilities give us the power to create ground-breaking tools and machine tool accessories that will perform with amazing precision and reliability. Our products simultaneously offer the highest possible level of performance while providing the lowest cost-per-part for our customers. We are continually striving to improve our technology through constant innovation to enhance the respect and reliability our products have earned. 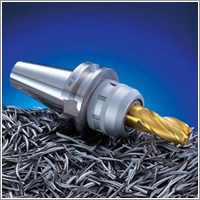 After the Nikken Milling Chuck was introduced to the market for the first time in 1963, the straight shank end mill was launched, and thus the Nikken Milling Chuck contributed not only to the Japanese market but to industries worldwide as well. 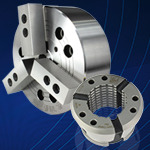 The Nikken milling chuck continued to be improved and has developed into the new Ultra-Lock model. Nikken was appointed to produce the retainers for the initial design of the wheels on the bullet train when the Tokaido Shinkasen line (Tokyo-Osaka) was launched in 1964. 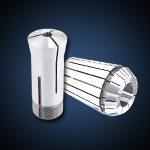 The component was one of the most difficult to produce requiring higher precision and finish compared to typical components of the early 1960’s. Since 1984, all Nikken CNC rotary tables have implemented the carbide worm system and hardened steel worm wheel design to create durability and less friction in between gears. Over the years the table standard rotation speed of 5min−¹ has been substantially improved to the high speed of 44min−¹, ushering in a new era of high speed gear driven indexing. Lyndex-Nikken has a team of dedicated engineers to support and develop customer applications and inquiries. Individual customer components can be assessed for full turn-key proposals. Because we share the same commitment for high quality and technology, many of the greatest machine builders and metal working companies have chosen to partner with Lyndex-Nikken. Our products (toolholders, rotary tables, custom tools, and live tools) enhance our partners’ machining centers, optimize their capabilities, and maximize their productivity.